When Singletracks imports fitness data from a service like Strava, our server attempts to match your ride with one of the trails listed on Singletracks. This allows us to add the trail to your "My Trails" list, check you in at the trail, and submits a route on your behalf. If a ride cannot be matched, it may be because we don't have GPS data for this trail yet OR we don't have this trail listed at all. To link your ride with a trail, follow these steps. 1. 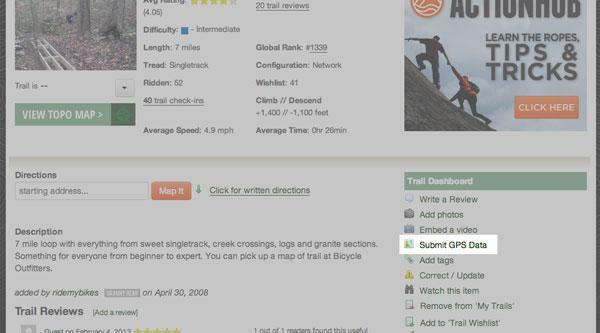 Search for the trail on Singletracks using the search box at the top of any page. a. If the trail is already on Singletracks, it may be that we don't have GPS information yet OR we don't know about the trailhead you used on your ride. Not a problem--just click the "Submit GPS data" link on the right side of the trail page then "Add a point of interest." 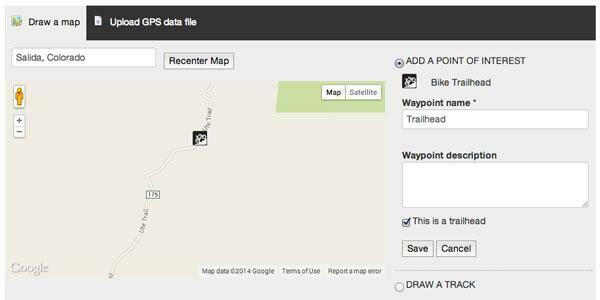 Click the map to pinpoint the trailhead and save it. b. If you can't find the trail information on Singletracks, add it using this form. Then, follow step 1a above. 2. Wait a day or two. We moderate all GPS data submissions to make sure they're accurate so the trail location won't be available immediately. 3. Once the location data has been approved, go to your activity tracker dashboard and choose "re-sync" from the action menu on the appropriate ride. The row will be yellow to let you know it hasn't been linked to a trail yet. 4. If the location data you submitted matches up with your activity data, everything will be linked up! Why is there a dropdown menu in the trail column for my ride? Some rides may include multiple trails while other rides may begin at a trailhead that's shared with multiple trails. Choose the primary trail for your ride even though there may be more than one appropriate choice.